As we revel in the holiday season many excesses present themselves: socializing with loads of calorie dense foods and alcohol; treats at work; running around shopping and wrapping not to mention travelling; stressors run the gamut from feeling tapped financially, feeling overly busy and include all the emotions related to the season. Add in a potential lack of sleep and being out of routine with exercise, the holiday season can create a perfect storm poised to ruin your weight control goals and intentions. Some of you won’t want to limit the festive holiday food and drink. No judgement at all (I personally cannot wait to scarf sausage rolls)! But if you happen to be on a weight or sugar management journey, I’m excited to share with you some tips and info I learned from a book titled The Hungry Brain- Outsmarting the Instincts That Make Us Overeat by Stephan J. Guyenet, Ph.D.
Food can be a powerful reinforcer tugging on the reins of our behaviour. Certain types of foods can trigger addiction-like behaviour in some people: high concentrations of sugar (refined grain carbs), fat, salt, and caffeine. There are hormones, called endorphins, in our brain which release when something pleasurable happens in our body. Eating things like chocolate is one of those things. The brain and body are hardwired to survive and historically foods high in fat and/or starch would be sought after to sustain the body. So when we eat something sweet or fatty, and we find that food rewarding, the pleasure chemicals are released but in addition, the learning chemical (dopamine) also gets released. So the brain begins to be motivated to eat such foods. And after you’ve learned that the sight and smell of say french fries predicts a fatty, starchy reward in your belly, your brain will trigger motivation to eat fries when you encounter them. A bit more on addictive properties of foods: those properties listed above (sugar, fat, salt, caffeine) become significantly more addictive when highly refined and processed. Plus, modern chemical combinations in processed, look-like-food substances may increase their addictive qualities. Witness me with certain cookies, fresh bread or cinnamon buns… if easily accessible to me they call to me – there’s no stopping at one… rather I keep eating even when I know I’m heading into a stomach ache. Guyenet advises us to beware highly rewarding foods. Guyenet’s top tip is to fix your food environment. Ideally don’t allow your brain to sense “high reward” aka addictive foods. Avoid feasting your eyes on those treats and avoid smelling them if possible. Keeping such foods out of your world/house is the best strategy. However at this time of year that can be very difficult. He suggests playing a little game with your brain in those moments when you’re about to reach for that pastry or french fry. When deciding whether to eat that treat, imagine yourself in the future, vividly enjoying the positive events you’re striving for (maybe 20 lbs lighter, laughing, healthy, in a really positive environment, maybe summiting that hill you’re hoping to climb, or finishing that race). If you delay picking up that treat to play this little game, your brain’s decision-making will weight your future self more heavily than your present tempted self and reduce your intake of the wrong foods (apparently by 1/3 in women). Another little tip is keep your food simple: less sauces, condiments and spices (I would struggle with reducing spices). His point being – design as simple of an eating plan as you can live with in the long haul to reduce the tendency to overeat. At a buffet or with things like tapas, this could work well during the holidays if you simplify your plate ie. choose three items you think would make a satisfying meal and stick to them. You’ll probably feel full on fewer calories. Another good tip for anytime but especially as you head out to holiday gatherings is to manage your appetite by pre-eating a healthy meal with lots of fibre and healthy fats to tell your brain you are not starving. If your brain thinks you’re starving it will eventually wear you down no matter how strong your resolve. Finally, don’t forget the importance of sleep for weight control. Make sleep a priority. And equally important is moving your body to burn calories but also to manage stress and help trigger those feel-good endorphins. Hitting the gym is not the only way: Dance the night away or calm the beast with some mindful movement practices. From all of us at Balanced Motion Pilates and Yoga to all of you, we wish you a very happy holiday season and a healthy, peaceful, enriching 2018!! This is my own version of Golden Milk. The main ingredient of Golden Milk is Turmeric, which is an amazing spice for reducing inflammation. 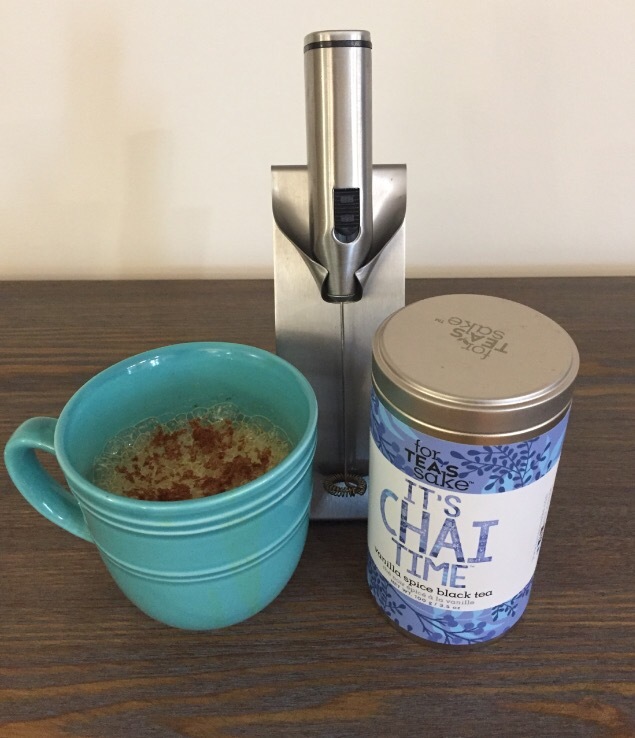 Sometimes though it can be a little chalky tasting or over powering so I LOVE to combine it with my Chai Tea ( from Findlay’s). It is a wonderful Fall/Winter drink. It gives you a little bit of a pick-me-up and satisfies my craving for something smooth and creamy mid morning or mid afternoon. Grab a blanket, your magazine and enjoy your tea! 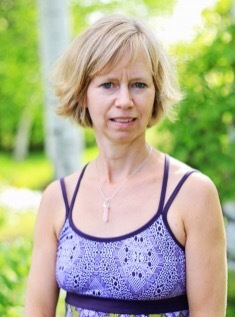 Lorrie Mickelson, M.A., B.A./BPHE, Registered Yoga Teacher, Certified Pilates Instructor, Certified Personal Trainer, activeoptionsbylorrie@gmail.com, 705 647 2848.